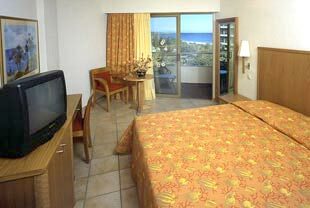 The Hotel The Blue Sea Beach Resort is situated 8,5 km from the well- known old city of Rhodos on the sandy beach Faliraki. It is a modern 4 Star Hotel, with 316 rooms. Standard Rooms are located in the main building and include Satelite TV, pay TV, hairdryer, bath amenities and laundry service on extra charge. Standard Rooms are located in the north and south buildings and include Satelite TV, pay TV, hairdryer, bath amenities and laundry service on extra charge. Each deluxe Suite is located in the south building of the hotel and includes Satelite TV, pay TV, hairdryer, bath amenities, laundry service on extra charge and, beach towels and welcome packages. Bars & Restaurants: At Blue Sea Beach Resort, delectable cuisine is served in 2 different restaurants. (Restaurants: Main Restaurant, Wine Cellar, Snack Bar), (Bars: Main Bar, Pool Bar, Beach Bar). Sports & Recreation: For sports lovers, the Hotel offers footbal court, squash court and a variety of activities like Gym Factory, Sauna, etc. (Pools: Outdoor Adults Pool, Outdoor Childrens Pool, Indoor Adults Pool, Indoor Childrens Pool), (Indoor Activities: Jacuzzi, Sauna, Gym Factory, Massage Room), (Sports: Squash Court, Tennis Courts, Beach Volley, Football Court, Water Sports, Beach). Daytime Activities: Children of all ages are also particularly welcomed. The hotel offers childrens club. Evening Shows: Program of entertainment activities daily. Folklore dance presentation and live music every Week. Conference: The Blue Sea Beach Resort Conference Hall is facility than can be tailored to suit your needs. Flexibility create synergies to stage successfully conferences and seminars. CONFERENCE ROOM B: Theatre Style - 200 pax, School Type - 130 pax, Audio & Visual Equipment (Available on Request). Είστε ιδιοκτήτης ή διευθυντής στο BLUE SEA RESORT HOTEL; Εγγραφείτε τώρα για δωρεάν εργαλεία, που μπορείτε να χρησιμοποιήσετε για να βελτιώσετε την καταχώρησή σας και να συνδέσετε την ιστοσελίδα σας και το σύστημα κρατήσεών σας.